discussion of the Iraqi army's war against the US axis. Highway 80 was a six lane highway leading across the desert from Basra, Iraq to Kuwait City. It was one of the main highways that gave Iraq quick access into Kuwait during their invasion of the country, but their return trip would be much less triumphant and horrifically deadly. 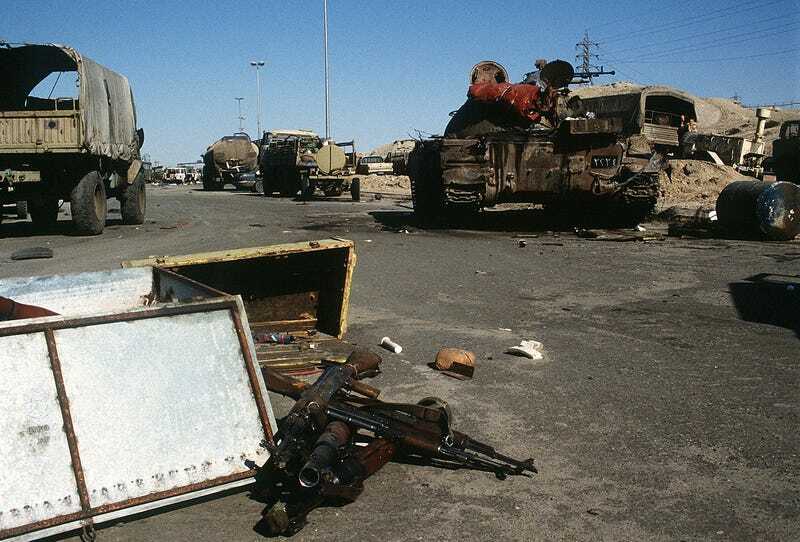 On the night of February 26th, 1991, after over a month of heavy bombardment and facing the full onslaught of advancing coalition grand forces, thousands of Iraqi military personnel and vehicles, as well as a sea of stolen Kuwaiti cars packed with looted valuables, attempted to retreat from Kuwait. At the time, Iraq had announced that it would withdraw, but it had not accepted the UN resolutions passed against them. There were not many route options that ran between Iraq and Kuwait to stage a large-scale military retreat. 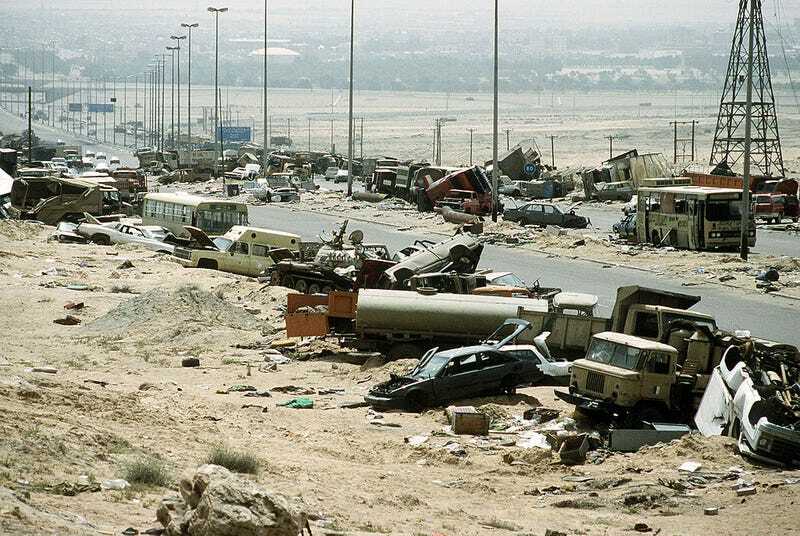 As a result, a massive amount of Saddam’s forces deployed months earlier to seize Kuwait were now crowded along the few highways that lead out of the country and into Iraq—the main one being Highway 80. 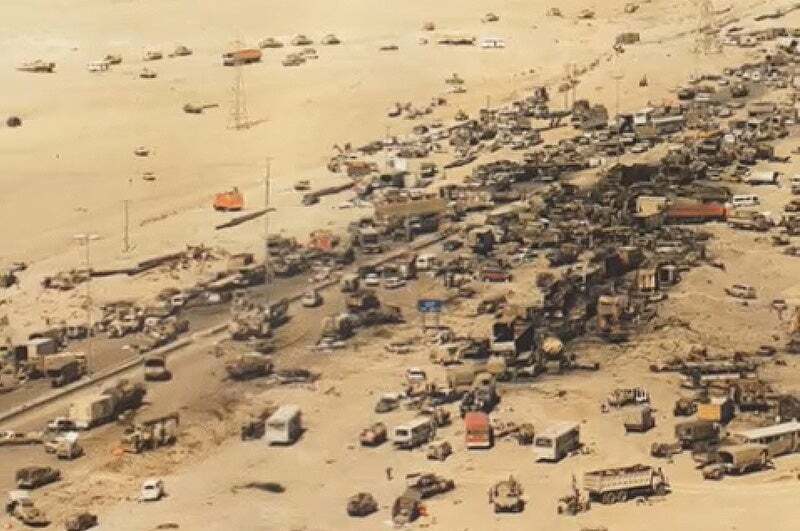 Intelligence on the ground in Kuwait reported that the Iraqis were packing up, but no hard actionable intelligence could be had for targeting the retreating force. Kuwaiti intelligence advisers told U.S. commanders that their their countrymen would not be among the traffic leaving, and that the coalition should engage freely. 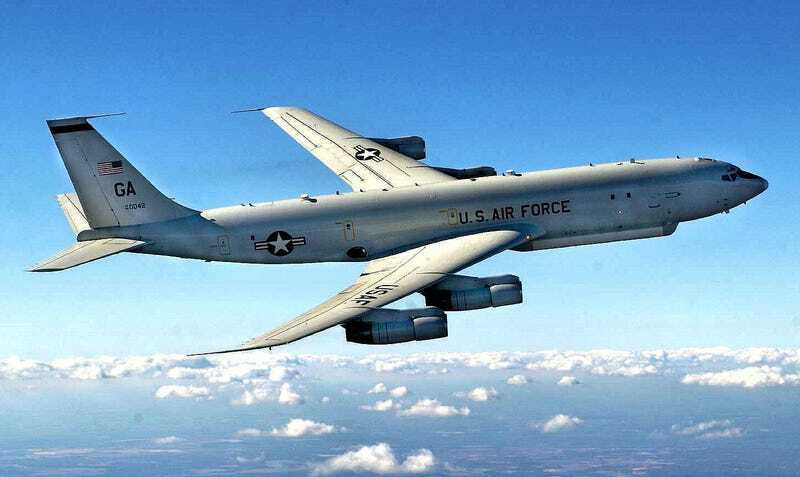 Then one of America’s newest super-weapons, the E-8 Joint Surveillance and Targeting Radar System (J-STARS)—made to detect and track moving vehicles on the ground—reported something unusual. What appeared on their radar scopes seemed to be a huge convoy traveling north, leaving Kuwait City and heading toward Kuwait’s northern border with Iraq. All available aerial attack assets were vectored towards the huge three mile long convoy of armor, trucks, buses and stolen civilian vehicles. The weather was an issue at the time, and visibility was made worse by the hundreds of oil well fires set by Saddam’s military during the war. USMC A-6E Intruders that were patrolling the Kuwaiti coastline were first on the scene and armed ideally for the grim job at hand. The jets were carrying Mark 20 Rockeye cluster munitions which could rain devastation over a fairly wide area. The Intruders aimed at the front and rear of the convoy. If the munitions landed correctly, the tactic would trap all the remaining vehicles in between burning vehicles and cratered sections of highway on both ends of the convoy. In effect, it would turn the roughly four mile stretch of road into a bombing range. The cluster munitions did their job. Both ends of escape were cut off, and vehicles at the head of the convoy careened into one another if they were not destroyed by the crescendo of sub-munitions. What happened next remains highly controversial to this day. Wave after wave of coalition aircraft had their turn attacking the trapped vehicles. Flights of A-10 Warthogs were especially deadly, flying below the weather and expending all their munitions and cannon ammunition during multiple attack runs. The stretch of highway was worked over by coalition aircraft for 10 straight hours. Aboard carriers in the Gulf, any munitions ready for loading were being ordered onto fighter and attack jets with haste. Many of the vehicles that attempted to flee by driving off the highway were hunted down and destroyed. a nice article from gurkhan on the US loss of over 21 abrams tanks during 1991. Operation Desert Storm was the first US invasion of Iraq. By that time, the country was exhausted by the conflict with Iran and the ensuing war with Kuwait. The exhausted economy and the war-tired army of the country could not counter the American-British strike. In addition, the Allies were superior to the enemy technically and had total air superiority. 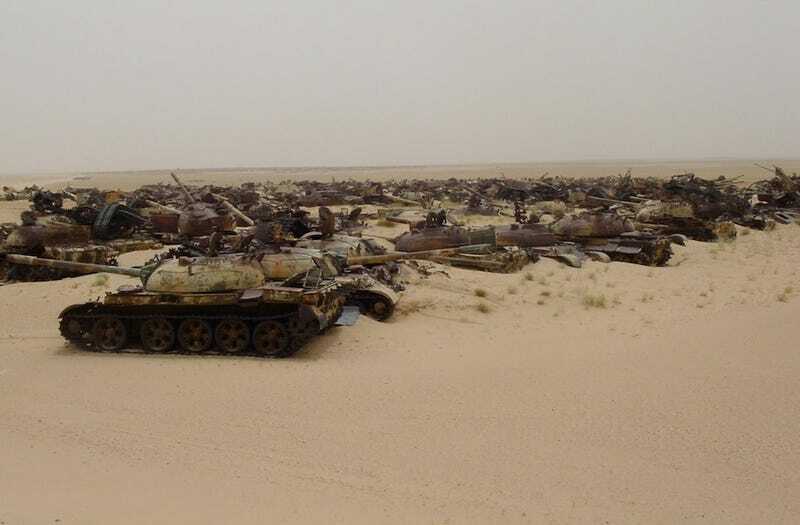 However, in a month and a half of the operation, the American army lost 21 Abrams tanks (all vehicles were lost in the last days of the operation). Nature played a cruel joke with the operation “Desert Storm” - when the main ground fighting began, a sand storm really arose in the desert. In some areas of the front visibility was only a few meters. In such conditions, the American army itself became the main scourge of the American army - they suffered the main losses from "friendly fire". On the night of February 26, the 1st Armored Division launched an attack on the positions of the Iraqi Tavakalna Division. 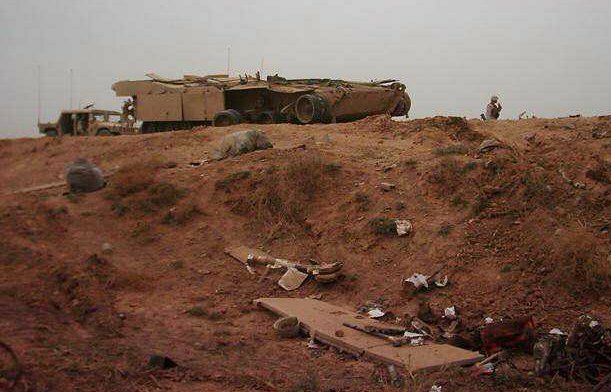 The American technology was equipped with night vision devices, but due to poor visibility, the TF 1-37 unit literally ran into the Iraqi’s trenches. The latter themselves did not see the enemy, with the result that the battle began at a very short distance, literally 50 meters. The pilot of the Apache, called in support of the AH-64 helicopter, didn’t really understand the situation and fired at all the equipment that he had found in the Tavacalna positions. It got to everyone, but it was the American tankers who had the hardest time. Besides the fact that they themselves did not really understand where the friend was, and where the enemy was, so the air strike turned the battle into complete chaos. As a result, the vehicles numbered B-23, C-12, C-66 and D-24 were seriously damaged by Hellfire missiles. In particular, the B-23, lost after the "air support" of the power unit, was the victim of the Iraqi T-72 and was set on fire. D-24 got off with external damage and a transmission failure. C-12 was the least fortunate. Not only did the Apache shoot her, but American tankers were discharged as well. Already on the afternoon of February 26, another major battle took place, this time in the Norfolk sector. There, an American division of the 2nd Armored Division TF 1-41 was ambushed by the Republican Guard. 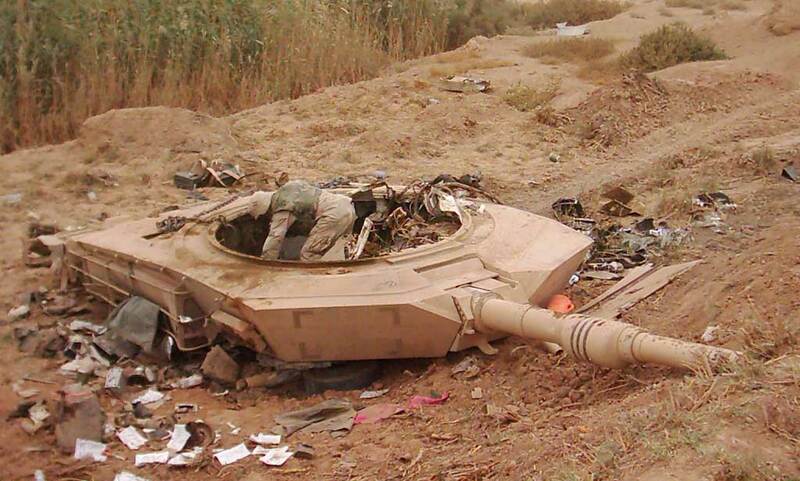 The only destroyed "Abrams" first got a grenade from an RPG-7, and then three more armor-piercing from the T-72. Four more cars received various damage, while one tank became a victim of “friendly fire”. 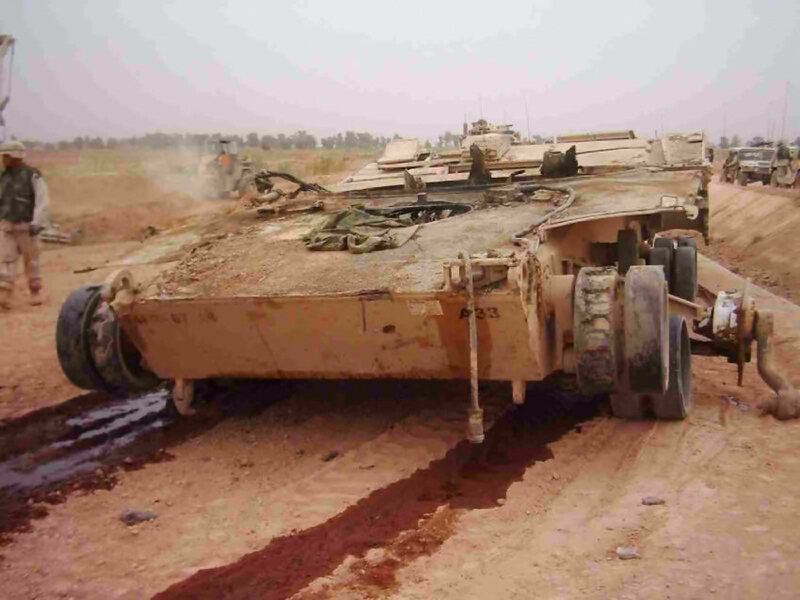 Already on February 27, the 197th brigade lost three Abrams at once. Machines were attacking the airfield Talil. On the eve of that area, it rained, which turned the sandy soil into impassable mud. 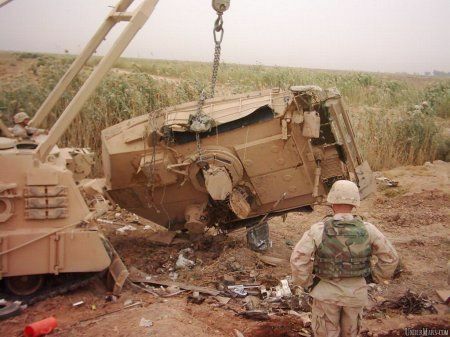 All three vehicles were stuck within the reach of Iraqi artillery. The Iraqis themselves, because of the difficult terrain, did not see what kind of gift they had under their nose, but the American command decided that the enemy’s guns were silent, awaiting the arrival of the rescue team. Then it was decided to simply shoot their own tanks from the air in order not to leave them to the enemy. On March 2, a lone group of Iraqi T-72 ambushed an American convoy. The head "Abrams" A-22 was set on fire, which led to the detonation of ammunition and throwing the tower. 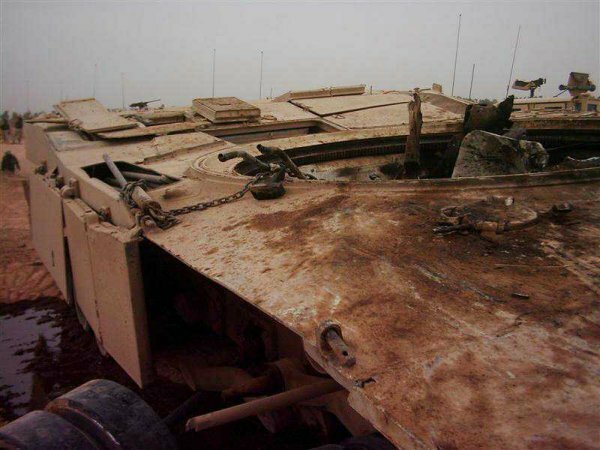 In the course of Operation Storm in the Desert, several more Abrams were damaged, but the circumstances of their battles remained unknown. More to the losses of the American army in Iraq, the Americans themselves are often attributed to the fire at Camp Doha, which occurred on the eve of the operation. 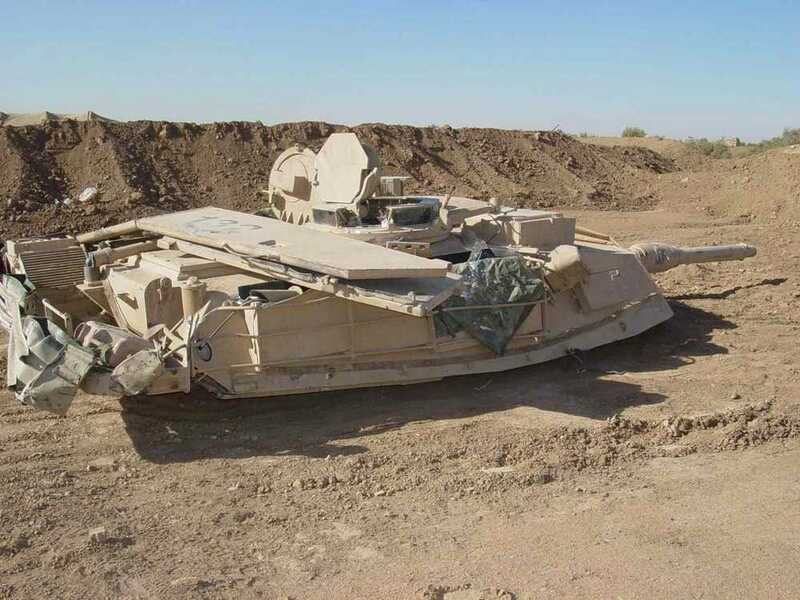 In addition, the Abrams engines that were not designed for the heat of the desert turned out to be imperfect. On spontaneous combustion engines losses account for more than combat losses. مما أدى إلى أنفجار الذخيرة ورمي البرج. ليس وحدها التي-72 يرمى برجها خارجا"
lots of pictures in the link. have a look. I didn't have time to post them here. Here are some of them but not throwing the tower?! I'm not sure those pics has been taken in 1991 or 2003.